This practical guide presents the key issues that every senior media or communications executive needs to know about the distribution of audio and video programming using internet technologies. 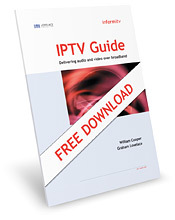 Based on their original influential independent report, IPTV: Broadband meets broadcast - The network television revolution, informitv and Lovelace Consulting have produced this exclusive executive overview of internet protocol television and the emerging market for delivering audio and video services over broadband data networks. The IPTV Guide explains in simple terms precisely what internet protocol television means and what it means for your business.